The rescue group named her Princess, but that name isn’t working for us. This will actually be the the first time we’ve renamed a bunny. I suggested Viola, but Art didn’t like that. Petunia has possibility, and Art’s also thinking Vanilla. I like Petunia the best. After nearly a year as a bachelor he seemed to be getting lonely so, yesterday we did the whole fun “bunny speed dating” thing to see if we could find a love connection for Derby. Only one girl did he terribly dislike — immediate fighting ensued. The rest he seemed only marginally interested in, but Miss Petunia (formerly Princess) did an admirable job of showing him her finer qualities both in ear licking and generally being an all around good bunny. We briefly thought we’d end up with two new bunnies. A sweet girl named “Drummer” who was found as a stray living on the streets of Baltimore almost came home too. And seriously folks — what the hell makes someone think that a white domesticated rabbit can live in the wild. Don’t dump the damn things in the streets of the city or the country. Anyway. The three were getting along pretty well, but then some bickering began and sadly we opted for the sweet Petunia. 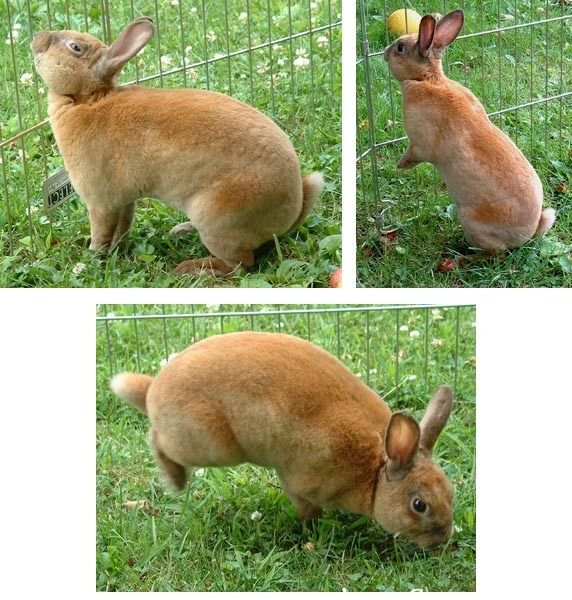 Drummer was really sweet, but she’s just not used to other rabbits and I think would do better on her own. Bunny Magic Rabbit Rescue is where we adopted Petunia. 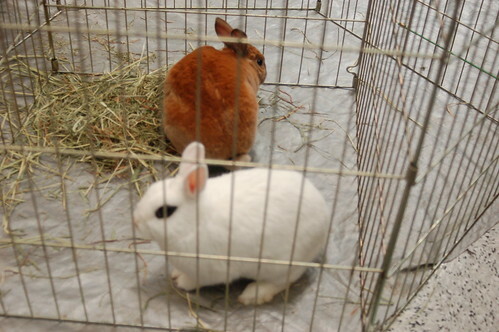 They had many, many rabbits who still need homes as do several other local rescue groups. Yeah! I’m a CuteOverload.com pointer-outer! I sent this photo to CO months ago, and it appeared to day. 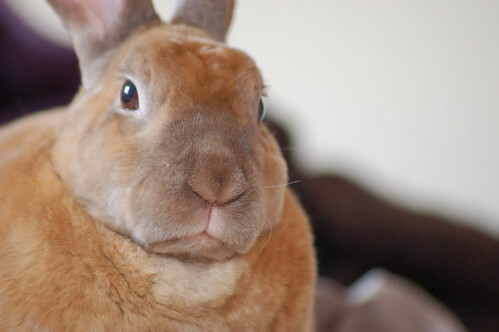 And……we found out that a picture of Paisely that he sent to Disapproving Rabbits ages ago was included in the forthcoming Disapproving Rabbits book . As you can see, he was a master of disapproval. Dora was no slouch either. What an Internet Phenomenon experience week! Nothing like camping and bringing the bears with you. 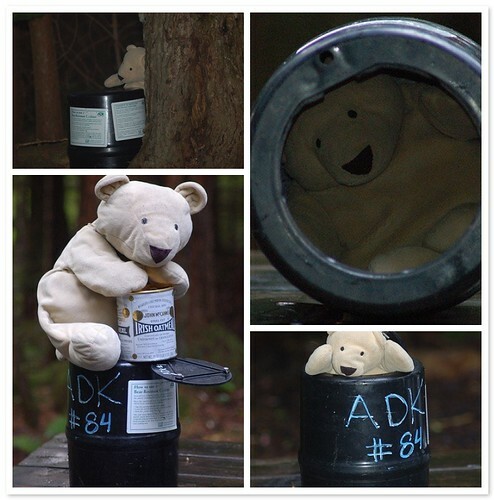 Our bears proved that while bear cans may be resistant for wild bears — the teddy bear has no problem breaking into it. 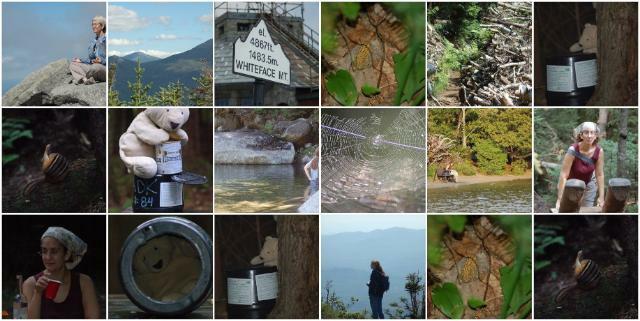 Pictures from our recent trip to the Adirondacks. A few more on Art’s Flickr account. 1. Carly finds inner peace atop the castle of yore, 2. Wright, Marcy, Algonquin, 3. Atop the Castle of Yore, 4. toad, 5. At the base of the slide, 6. We did a poor job of hiding our bear can, 7. We didn’t know chipmunks could do this!, 8. The largest bear made off with the oatmeal, 9. Rocky Falls, 10. the weaver, 11. reading, 12. 07-08-06 038, 13. The Vodka Drinker, 14. Stuck?, 15. We did a poor job of hiding our bear can, 16. Art, 17. toad, 18. We didn’t know chipmunks could do this! I think one of the reasons Art and I like hiking in the summer is the foraging! We found lots of wild raspberry bushes along the C&O canal. 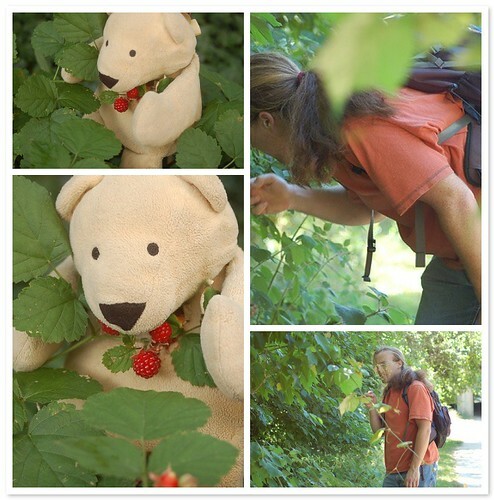 We also have a couple of raspberry bushes in our garden, which is where the picture of the teddy bear was taken. Mosaic Monday, originally uploaded by Carly & Art. Art had a delivery this weekend to a great guy who has a small farm with chickens, turkeys, guinea hens, horses, peacocks and a few other animals. In Memorium — Dora — 1999-2007, originally uploaded by Carly & Art. We lost her yesterday. She was just a great bunny. The one on the bottom right was taken the day before she died. Big bunny news! Well, actually — little bunny news. We went to bunny adoption day today, or as Dora likes to call “speed dating.” Dora met four fine gentleman, and finally selected Derby, a handsome brown mini-rex. One of the four, Bramble, decided that nooky was the way to start their encouter — he was instantly ruled out. Dora is just not that kind of doe. 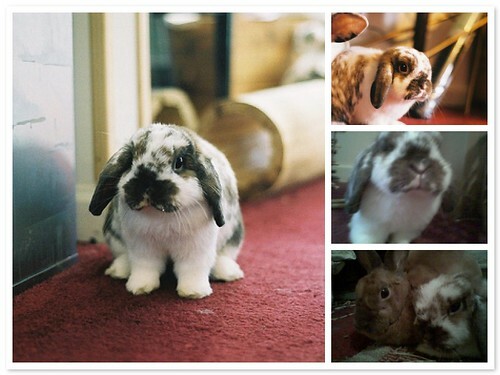 It was too bad, he was a handsome rabbit and very outgoing. She also met with Bales and Fiejte. Both were most polite and fine candiates, but in the end she and Derby just hit it off. Derby also did a fine job of winning over Carly and Art. He sat on Art’s lap while the other boys went to meet Dora. He looked a bit jealous and concerned. Later when he and Dora had the chance to spend a little more time together with Carly chaperoning — he turned his charm on Carly. He hopped about her, nudged and tugged on her shoelaces. He also was most willing to stop for petting. Derby and Dora had a bit of ear licking and cuddling, then groomed themselves and just got comfortable being around each other. Derby is a little skittish, because one of his fellow foster-bunnies recently attacked him, but he figured out quickly figured out that Dora was a good bunny that would make a fine friend. 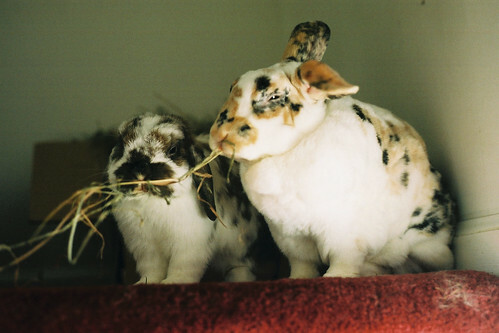 They found much common ground including a shared love of timothy hay and papaya treats. Dora and Derby are currently off on their “bunnymoon,” and should be arriving home in about a week to their fabulous two-story cottontail cottage. 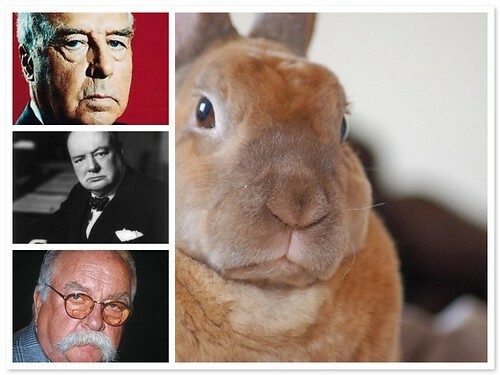 They have registered at Bunny-bytes and, of course, donations to the House Rabbit Society are always appropriate. Mr. Paisley can’t be replaced, but we think that Derby and Dora will be quite happy together. Mr. Paisley died today. We’re very sad. Dora is very sad. were giving him medicine and fluids, but I guess it was just too late. We had him for almost half of his life. He was about eight years old. and he gave us almost four years of love and fun. hind legs and balance on my legs trying to get carrots. — an all around good bunny.